With Thanksgiving just around the corner, it's time to think beyond the turkey. I'm testing some new side dishes to perk up my menu. They need to be simple and light, festive and seasonal. This acorn squash is all that. The sweet and tangy glaze has only 3 ingredients and is so delicious you could eat it with a spoon. It's wonderful drizzled on roasted Brussels sprouts as well. You can find pomegranate molasses at Trader Joe's, Whole Foods, Amazon prime, and some specialty stores. Or you can make your own. Recipe from Alton Brown here. Combine the molasses, lemon juice and honey in a small bowl and mix well. Set aside. Wash acorn squash and dry thoroughly. Using a serrated knife, cut the squash in half lengthwise. Using a spoon, scrape out the seeds and discard. Cut the squash into 1/2 inch rings. Transfer to a bowl and toss well with the olive oil, salt, and pepper. Transfer to a baking sheet and bake in one layer for about 20 minutes until soft but not mushy. Remove squash from oven and gently toss with glaze. Reduce oven temperature to 375F. Bake squash another 5 minutes. Watch carefully so that it doesn't burn. 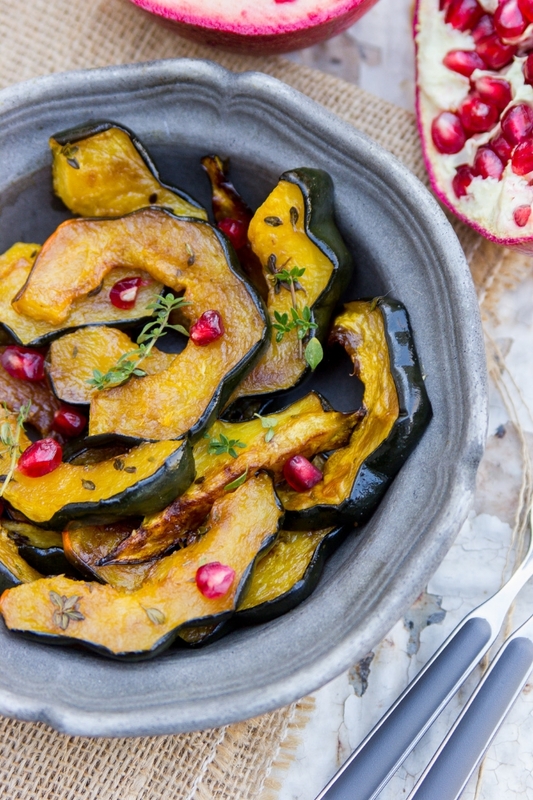 Serve sprinkled with pomegranate seeds and fresh thyme.